Iselin Steiro photographed by Ezra Petronio for Self Service Magazine issue 38. Styling by Suzanne Koller and Iselin is wearing a tuxedo jacket from Fursac and tank top from American Apparel. Effortless cool right? Topshop’s more high-end brand, Topshop Unique, has been well-appreciated among fashionistas for almost 24 seasons now. Since the popularity of the line Topshop Unique is expanding and for next year there will not only be a Spring/Summer and Fall/Winter collection but also a pre-fall and resort line. A selection of evening wear and accessories will be featured including georgette silk dresses and tailored jackets. As far as I am concerned, the first small resort collection that will be released in November, looks really nice. Simple, modern and easy pieces to wear both for an everyday use as well as for the evening. What do you guys think? On my mind you’ll find the combination of elegance mixed up with casual. New Balance sneakers, with a white tux paired to perfection. I totally fell head over heels with this previous editorial, ‘New York’ from the latest Vogue Paris. That is why I had to throw some things together to re-create a mix of the looks in the editorial. I just love the idea of taking on the Grunge-style in a bit more sophisticated way. Like pairing slippers with a classy trench coat or an elegant suit jacket in satin. Or giving the pleated/checked pieces an lighter feeling, like the Dries Van Noten shirt and trousers in checked wowen silk. Mixing heavy materials like wool and denim, with luxurious ones like silk and mesh, creates a flawless and very wearable look. On top left you’ll find: trousers from Theory, silver metallic jacket from Rochas, crepe and silk-blended satin tuxedo jacket from Guilietta, suede waist-belt from Alaïa, slippers with fur details from Céline S/S13, socks from Falke and leopard gloves from Alaïa. 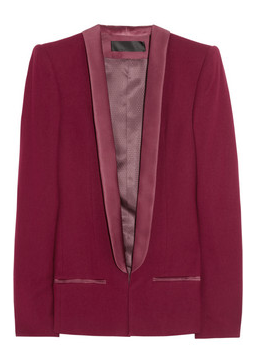 Totally in love with this wool-blended tuxedo blazer from Haider Ackermann. Couldn’t be a better colour! I would style that deep rich purple-red plum blazer with either a pair of light pink wool capri trousers or a tight knee-long skirt, of course in pink as well. I’ve spotted a gorgeous one from Rochas that would be a match made in heaven with the tuxedo…dream on.